Whether we’re talking about large, small or medium size inflatable paddle boards, ISLE Surf And SUP has always been the go to brand. 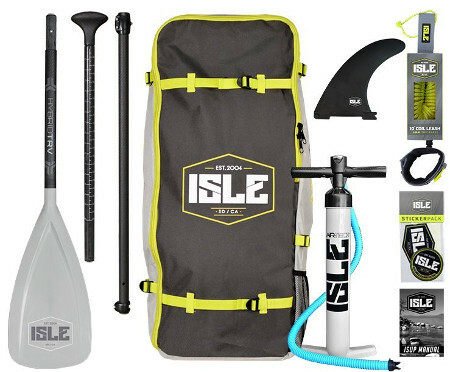 Indeed, it is undeniable that ISLE is one of the few iSUP brands out there that has accumulated almost nothing but positive reviews on most its products and that did not come easy. The company at hand is strongly dedicated to its customer base and that is why it has specifically designed this board to be the perfect match for Yoga lovers. Indeed, this ISLE is suitably designed to cater for the needs of yoga masters which is evident on the level of hull design down to its smallest features. First things first, in terms of length, the ISLE at hand comes at a perfectly compatible 10 feet . This is truly one of the most appreciated size ranges in the industry simply because it can accommodate for a large range of users, making your board compatible with friends and family of most sizes. Also, the board’s length does impact performance which will be further discussed under the performance tab. At 32 inches in width, you would imagine that this board is rather chunky but that’s absolutely not the case. In fact, the 32 inches fit smoothly within the 10 feet length of the board, giving the board a coherent and authentic look. Further, the board’s width will make it a whole lot easier for you to handle it on water because it is far more stable than boards measuring less than 30 inches. Consequently, the board will make it significantly easier for you to focus on navigation instead of continuously trying to stay on top. Thickness is not to be dismissed and especially when it’s about inflatable paddle boards. Indeed, thickness can say a lot about your board’s quality as we’ll dwell further upon in the coming segment. Hence, the ISLE Lotus Yoga paddle board at hand comes at a promising 6 inches in thickness which is what you want to hear, knowing that most cheap paddle boards under 6 inches are prone to bending at the center under a lot of pressure. PS: the board at hand has a maximum weight capacity of 240 lbs. Quality is the number one factor to inspect on any product but especially on inflatable stand up paddle boards because the last thing you want is a faulty or easily punctured board. Not to worry however since most famous brands in the industry feature some of the best quality materials which are often a lot harder than you can imagine. Accordingly, the ISLE 10′ Lotus Inflatable Yoga stand up paddle board at hand is made of ultra durable material, primarily consisting of military grade PVC which is the same stuff the army uses to build zodiac boats and some bullet proof vests. If that doesn’t say enough about the rigidity of the board then I don’t know what would. Moreover, the board is further enhanced via an industrial drop stitch construction which makes it virtually indestructible. Perhaps that doesn’t mean much on paper but in real life, this board’s build is capable of enduring the strongest clash against tough materials. Also, all ISLE boards go under a torture test which requires at some point that the board handles the weight of an entire car running it over. First and foremost, this ISLE, like many others, features an astonishing soft, anti-slip EVA pad. This pad will not only make it easier for you to maintain your balance on top of the board but it’ll also make it easier for you to navigate it while standing upwards. The board exhibits a number of D-rings in multiple occasions. First, there are the 3 rings at the center of the board which are connected by a bungee cord that serves as a cargo net. Then, there is the double set of rings on each side of the board which comes connected by a cord as well that can hold anything from a paddle to your sandals. Also, the board features an extra D-ring on the tail for safety leash attachment. 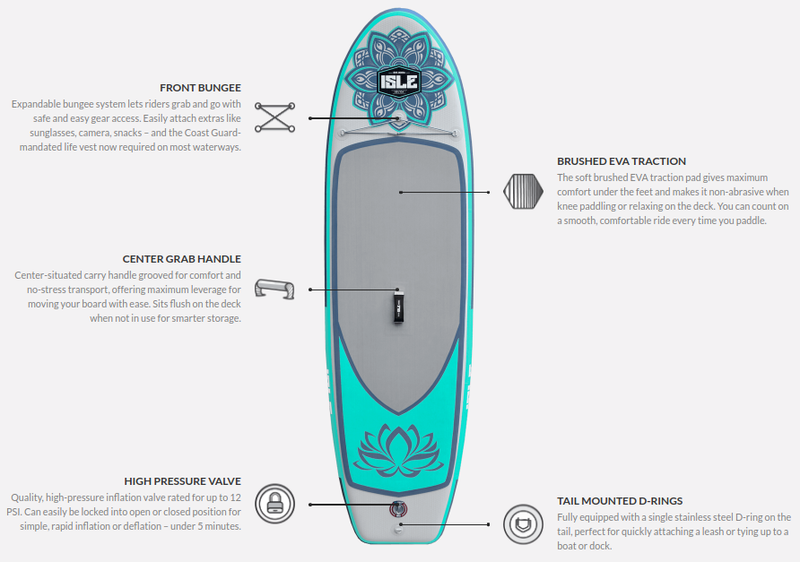 The ISLE Lotus Yoga inflatable paddle board also comes with a carry handle on the nose of the board which can be used to help you carry the board outside water or to tow the board from the front. 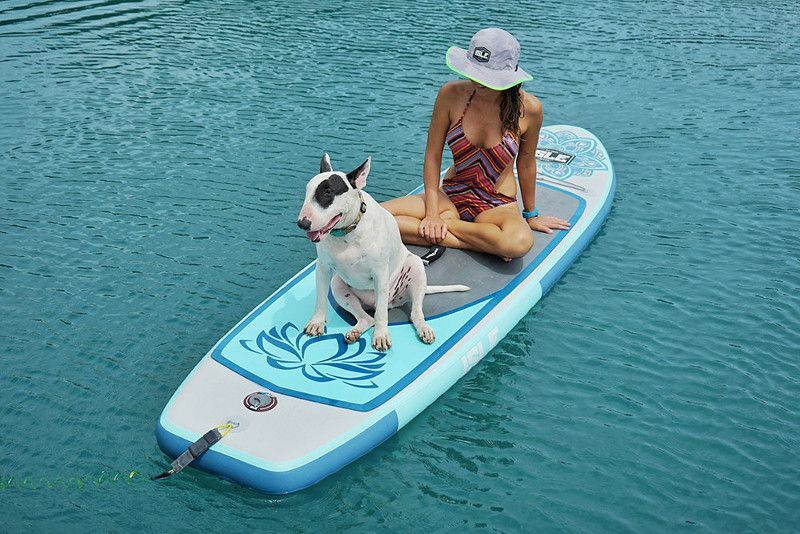 As far as tracking is concerned, ISLE didn’t save up any energy on this Yoga paddle board at hand and granted it the ultimate triple fin navigation system that every beginner needs. Indeed, the side fins will grant you the stability you lack at first and help you track in a straight line far easily than you would with a single fin board. 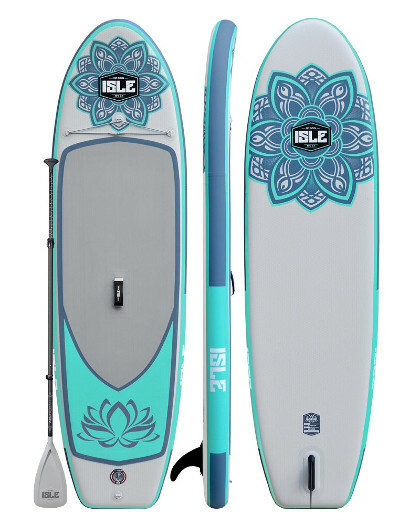 As far as performance is concerned, the ISLE 10′ Airtech Lotus Yoga inflatable paddle board is one of the best performing boards especially for beginners. The importance in the previous statement lies in the last word. In case you’re a beginner in the sport then you’re simply going to love the skillfulness of this board as it will make it extremely simple for you to navigate it due to the advanced tracking system and the overall design which makes the board significantly more stable than most boards out there. This is another reason why it’s a great board for yoga exercises and meditation. It takes a bit to get it at the desired pressure.